Global shares were down Wednesday amid falling business confidence among Japanese companies and sovereign debt in Europe. The Bank of Japan’s quarterly “tankan” survey indicated that the major index for large manufacturers dropped for the first time in seven quarters. Companies surveyed believe that confidence will keep falling in the following months as there have been concerns about highly-stubborn yen and slowing global demand. Japan’s Nikkei 225 stock average lost 0.1 percent to 10,309.78. Hong Kong’s Hang Seng index was down 2 percent to 23,975.35 while and the Shanghai Composite index dropped 0.5 percent to 2,911.41. However, in Australia, S&P/ASX 200 advanced less than 0.1 percent to 4,767.80. Kospi in South Korea finished at 2,017.48, up 0.4 percent. New Zealand’s benchmark also posted gains. 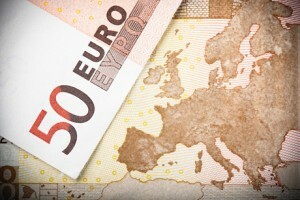 In Europe, the Stoxx Europe 600 index lost 0.4% to 276.59 in morning trading amid worries about sovereign debt. Spain led European stock markets lower, followed by warnings by Moody’s Investor Service. Spain’s Aal credit rating may be downgraded. Its IBEX 35 index retreated 2% to 9,960.50. However, Moody’s noted that country’s rating will most likely remain in the Aa range. Additionally, other stressed euro-zone countries do not have credit as much strong as Spain. Fashion retailer Inditex reported results for this year’s three quarters, which dragged 2.8% loss on its shares. Shares of Santander slumped 3.3% and BBVA dropped 2.6%. Other European banks like Barclays PLC and Deutsche Bank also slipped. ISEQ in Ireland fell 0.6%; FTSE MIB index in Italy dropped 1.3%; the U.K.’s FTSE 100 was down 0.4% to 5,868.30. The French CAC 40 index and the German DAX 30 index also lost 0.5% and 0.4% to 3,884.00 and 6,997.40 respectively. On the positive territory, Swiss drug company Novartis AG rose 4.6% thanks to its announcement of taking full ownership of eye-care specialist Alcon Inc. Shares of Hennes & Mauritz also dropped 1.7% despite its announcement of 8% rise in comparable sales for November. The figure was still 0.3% lower than the consensus forecast. Simon Property Group Inc. said that it had made an indicative proposal to buy Capital Shopping Centres Group PLC for 425 pence a share. This spurred shares of the latter jump 3.2% to 409 pence a share. In New York Tuesday, the Dow Jones industrial average added 0.4 percent to 11,476.54. The tech-heavy Nasdaq composite index gained 0.1 percent to 2,627.72 and the broader S&P 500 was up 0.1 percent to 1,241.59. The Commerce Department reported that retail sales rose 0.8 percent in November, the fifth consecutive gain. A survey which was conducted by the Business Roundtable showed that 45 percent of executives expect to add workers over the six coming months.